The quest to go faster on water has challenged both man and machine for centuries. Whether for trading, waging war, or simply winning a coveted trophy, the desire for higher speeds has been relentless. Modern-day challengers have a clear benchmark against which to measure their skill and ingenuity. The World Water Speed Record is the pinnacle of sporting achievement on water – a compelling contest played out on a backcloth of wind and wave, distance and time. The World Water Speed Record has a long and colourful history. Previous holders and challengers have included the Scottish-born, American-domiciled scientist, engineer and inventor Alexander Graham Bell, the fabled British soldier and author 'Lawrence of Arabia', and the legendary English 'speed kings' Sir Malcolm and Donald Campbell with their iconic Bluebirds. The Quicksilver World Water Speed Record Challenge is a collaborative venture uniting highly-skilled individuals, firms and other organisations from across the broad span of industry and commerce, drawn together by the man who founded the project, author Nigel Macknight. The ultimate aim is to bring this prestigious international prize back to these shores after its long absence. The Quicksilver craft is a new boat for a new generation. We are striving to extend the reach of human endeavour whilst advancing Britain’s technological achievements on the world stage. Do we lazily leave it so that this dismal state of affairs persists, or do we try to show that Britain can do better? Apathy reigned to such an extent that the idea of Britain never holding the World Water Speed Record again was being passively accepted before the Quicksilver bid came to the public’s attention. It was easier to bask in the achievements of yesteryear than do something about the future. But Britain cannot rest on its water-speed laurels forever! Australia has held the World Water Speed Record for 41 years, in spite of competition from America. The record speed is 317.60 mph (511.11 kph). It is 51 years since Britain was the holder, way back in Donald Campbell’s era. 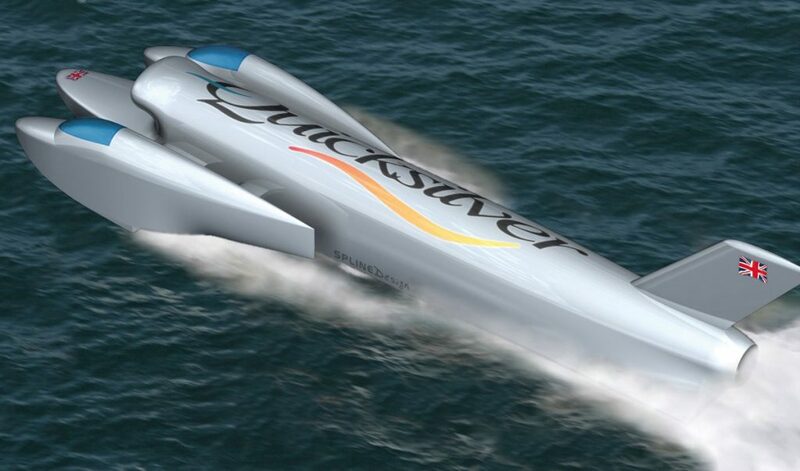 The Quicksilver project aims to break Australia’s long stranglehold on the record and return the trophy to our nation, which has made more water-speed history than any other. The Quicksilver craft is steadily taking shape on a diet of loyal support, some small-scale private funding and an irrepressible enthusiasm for the task in hand. Our philosophy is to employ modern technology in design, construction and operation so as to increase safety margins very substantially beyond what has been feasible in the past. Difficulties that can dog a project of this type have come and gone, and we have had more than our fair share of expected and unexpected setbacks. Delays have been the inevitable result, but none of this has blunted our resolve to keep up the effort and ensure that a boat is put on the water fit for trials. At that point we will see how all the dedication and hard work has paid off, and no doubt the learning process will continue. The manifold challenges of achieving ultra-high speeds on water are not easily tackled. At the opposite end of the scale, apathy can be easily challenged – as it dissolves and is conquered by the simple act of doing something. We hope you enjoy learning more about the Quicksilver quest via these website pages.